Tarrant County College District (TCCD) is one of the largest and fastest growing community college districts in Texas. 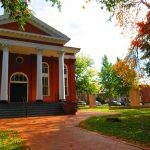 It has a credit student population of nearly 55,000 across five campuses. With a military base nearby, thousands of TCCD students apply for Veterans Administration (VA) benefits each semester. Laserfiche has made this time-consuming and paper-heavy process quick and efficient. In the past, students had to submit all VA benefits paperwork to the registrar’s office at their home campus. The documents were placed in a file folder and, if a form was missing, the student had to bring it back later to the same office, even if he was attending classes at another location at the time. Students can apply for VA benefits every semester that they are enrolled. As a result, a single student’s file may have between ten and 300 documents at any time. These files were stored in a vault from which they had to be retrieved each time someone needed to look at them. In person at any TCCD campus. This paperwork is scanned immediately into Laserfiche and the hard copies are returned to the student. By email. These forms are imported into Laserfiche with Laserfiche Snapshot. Online. Request for Benefits forms, commonly referred to as “green sheets,” can be submitted electronically through the Ellucian Colleague student information system. This form is saved on a network drive. From there, Laserfiche Quick Fields imports it into the Laserfiche repository. Employee ID of the employee scanning the paperwork. Campus where the document is scanned. Student ID (from Ellucian Colleague). Checklist of all the documents that should be in the packet. Once the paperwork is stored in Laserfiche, Laserfiche Workflow looks up the student record in Ellucian Colleague based on the Colleague ID. 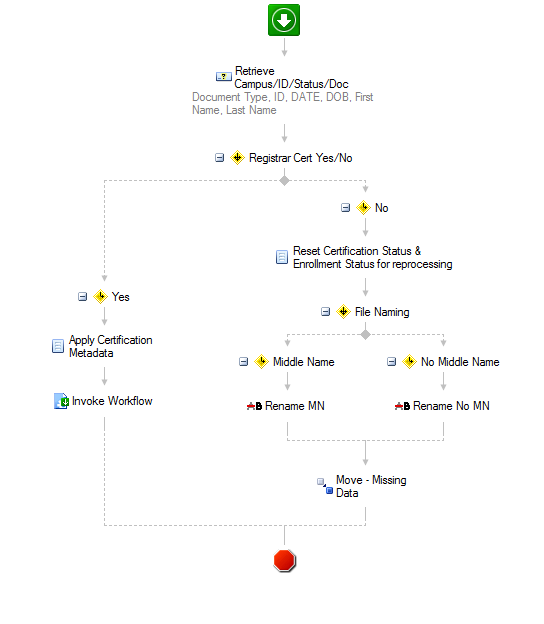 If an entry is not found, the document is renamed “Wrong Colleague ID” and the workflow is stalled until the Colleague ID is corrected. 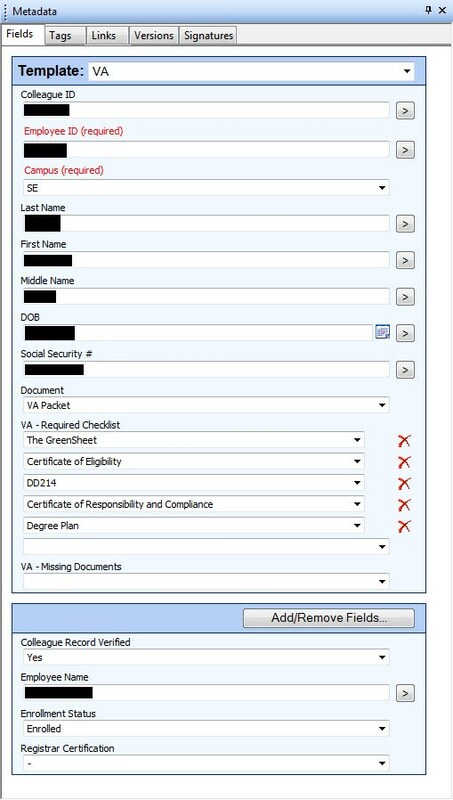 If the entry is found in Ellucian Colleague, the workflow looks to see if a student VA packet already exists (one would exist if the student had applied for VA benefits before). If a packet is found, the current document pages are moved into the packet document. The district VA rep is notified by email that the packet has been updated. If no existing student VA packet is found, the current document will start a new packet. 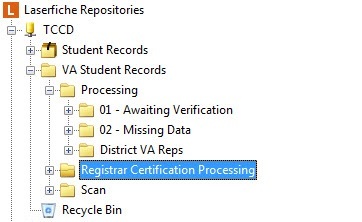 The document is renamed per the VA packet naming convention and moved to the Registrar Certification Processing folder. Metadata is populated based on the lookup into the Ellucian Colleague database. The VA district representative verifies that the metadata is correct and, if it is, s/he contacts the VA department to make sure the student is certified to receive benefits. If the certification step is successful, then the Registrar Certification field is changed to Yes. The packet is then filed in the appropriate folder for archiving and a new Student Records template is assigned to make the VA packet consistent with all the other student files. 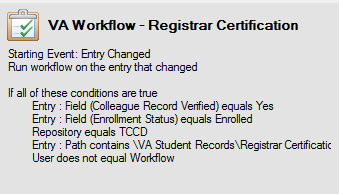 If the VA packet isn’t certified because some information was missing or incorrect, it is moved to the Missing Data folder. From there, the VA district representative contacts the student to obtain corrected or missing information. The student can then be certified. Students can now submit documents via email or in person at any campus. Since all VA packets are stored in Laserfiche, they can be retrieved easily. Previously, finding a student’s packet required a trip into the vault. Learn how Laserfiche has helped other higher education institutions automate business processes and reduce costs in this free, 101 page book: Quicker Better Safer: Higher Education.